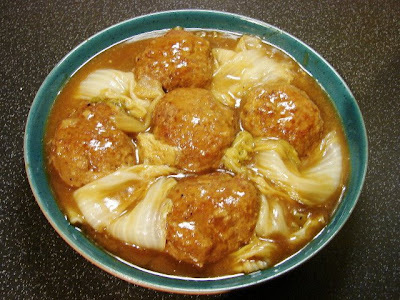 Shanghainese Lion heads are always stewed with Chinese leaves or nappa cabbage. These meat balls are called lion heads because the Chinese leaves covering the meat balls look like a lion’s mane. Nearly every housewife in Shanghai is likely to tell you she has the best secret recipe for these stewed (red braised) meat balls. This is a popular every day dish as well as the more elaborate festival or feast version. Every day version just plain minced pork to more elaborate recipes with added delicacies like dried Shanghainese crab roes, dried shrimp roes, dried scallops (conpoy) or fresh crab meat. Some recipe also add chopped shitake mushroom which I am not fond of. I like my meatball quite plain the only thing I will add is some chopped fresh water chestnuts to add texture to the meat. Many people will cook these meatballs in four to symbolise four happy balls or 四喜丸子 in Chinese but you can make as many or as big as you wish. But every Lion head recipe I had come across is always pork and never beef, don’t know where that woman on TV Ching He Huang get the idea from. The secret to good juicy melt in the mouth meatballs is enough pork fat with the meat balls. Many people will insist on chopping the mince by hand only. Stewing the meatballs for quite a long time also will tenderise the meat. Corn starch and water for thickening. Mix all the ingredient for the meat balls together, the mixture is quite soft another way to ensure the meatballs will remain soft and juicy after long cooking. Form into 4 -5 large meat balls. Leave in the fridge to set for 1 hour up to overnight if you want to make in advance, covered. Then coat the meat balls with plenty of cornstarch (to keep the meat balls juicy and thicken the sauce too). Then shallow fried or deep fried in high heat for about 1 minutes each side till lightly brown but not fully cooked through. Take them out and drain on paper. In a clean wok or deep large claypot, fry the ginger and garlic in oil till fragrant. Add the wine and stock and remaining sauce ingredients let that simmer for about 2 minutes. Add in the meat balls, cover and stew for about 45 - 50 minutes very gently. Split the Chinese leaves leave them whole don’t cut. Then add the leaves to the meat stew and continue stewing for another 20 -25 minutes till the leaves are meltingly soft. The leaves will melt to less than half and leave a lot of juice. Finally thicken the sauce with some slackened corn starch. Mmm, sounds great. I too like simple meatballs, keeping them meaty and juicy. I made these this evening and they were delicious - thanks for the recipe, Sunflower! I used turkey mince with a little melted butter (instead of pork fat), and used black fungus instead of water chestnuts.